The future of The Walking Dead remains bright despite the void left by Andrew Lincoln's exit if executive producer and director Greg Nicotero's sentiments are any indication. AMC's zombie series lost Rick Grimes on Sunday night. The show's central protagonist through more than eight seasons wasn't killed but he flew away, severely injured, aboard a helicopter with Jadis. While the details of his journey remain under wraps, Rick is confirmed to have survived his wounds and will return for a trilogy of films if chief content officer Scott Gimple has his way. As for the original series which a slew of original cast members and beloved newcomers remain aboard, there is a mysterious and bright future. "I think you got a little flavor of it right there," Nicotero said, appearing on ComicBook.com's After the Dead show, moments after The Walking Dead revealed a six year time jump with a much older Judith Grimes being introduced to conclude Rick's final episode. "I mean, there's so much great story coming up and you know I've done a lot of press and talked about Samantha Morton and The Whisperers, and we've been teasing a lot of that in this last promo," Nicotero said. "It really just feels like a different show." Part of what will make the show different is how reliant on its ensemble nature it will be. While no one cast member or character will be burdened with stepping up to fill Rick's void, several will be given more opportunities to shine moving forward. "And in a good way," Nicotero says of the show being different, "not in a way where we feel like there's a void that we have to fill." The conclusion to Episode 9x05 was very much intentional to keep fans hooked at a fast pace. "Part of the time jump, what that accomplishes is it gets us sort of past sort of playing, everybody grieving over it and it allows us to really jump into a sort of accelerated storyline where we don't have to feel like there's four stories with them grieving what they believe is the loss of Rick," Nicotero said. "It's a great device to introduce these new characters and I really love it." As for the Whisperers, fans will get their first taste of the villainous group known well by comic book fans in Sunday night's Episode 9x06. 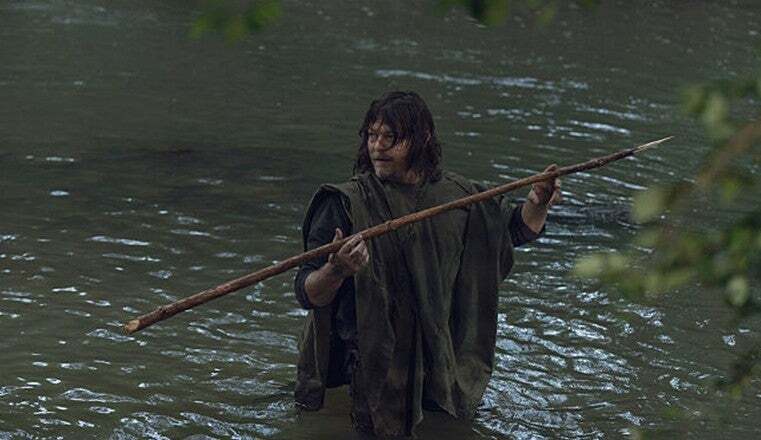 As for their leaders, Alpha and Beta (portrayed by Morten and Ryan Hurst, respectively), fans might not see them until The Walking Dead's 2019 episodes as only a trio remain in the first half of Season Nine.